The French numbering system is infamous for the compound expressions found between 70 and 99. But that’s not all: there are also a number (ha ha) of tricky expressions with some of the single digits, both ordinal and cardinal. First (hee hee) up is premier, which has different meanings according to the preposition used with it. Au premier means "at first" or "(on the) first." Au premier regard, c’est trop difficile. At first glance, it’s too difficult. C’est au premier rang de l’agenda. It’s first the agenda, at the top of the agenda. De premier means "essential" or "excellent." Il a joué un rôle de premier ordre dans les négociations. He played an essential role in the negotiations. Ce sont des produits de première qualité. These are first-rate products. En premier means "earliest" or "first(ly)." Il est arrivé en premier. He arrived first. En premier lieu, il faut décider …. First, we need to decide …. When talking about the floors of a building in French, UK English speakers won’t have any trouble, but US English speakers will. Le rez-de-chaussée is the ground floor, what Americans commonly call "the first floor." 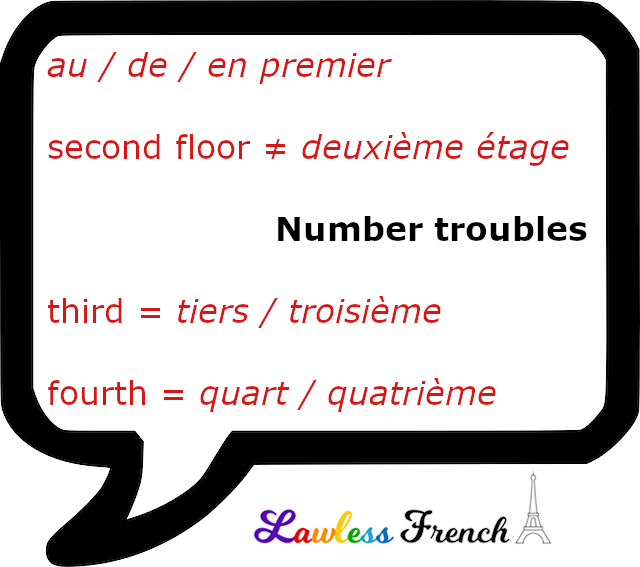 Le deuxième étage, literally "the second floor," is what Americans call "the third floor." And so on. For Americans, the French floor numbering system will always seem to be off by one. There are two ways to translate "second" in French: deuxième and second. Many native speakers use them interchangeably, but technically there is a slight difference in meaning. Second indicates the second of two. So using one or the other can offer some interesting insight into your thought process. Thierry est mon second mari. Thierry is my second (and last) husband. Thierry est mon deuxième mari. Thierry is my second husband (but there may be a third). In English, "third" is both an ordinal number and a fraction. French has different words for each of these. Serge est mon troisième mari. Serge is my third husband. Il a payé un tiers de la facture. He paid a third of the bill. Likewise, "fourth" has two translations. Yves est mon quatrìème mari. Yves is my fourth husband. Il a payé un quart de la facture. He paid a fourth (quarter) of the bill. The etymology of the word trimestre is easy to understand: three months, and that’s what it means in French. But in English, "trimester" means three months only when referring to pregnancy. In terms of academic years, it means "one of three terms," the duration of which is usually less than three months. In economics, un trimestre is equivalent to "a quarter." I actually like the compound higher numbers in French! At 74, I am still in my sixties!! !